Eric A. Greenbaum, M.S. J.D. Eric Greenbaum is a patent attorney and a biochemist. Mr. Greenbaum received a bachelor's of science in Neurobiology from Emory University in Atlanta Georgia. As a researcher in the cell biology department of the Genzyme Corporation in Cambridge MA, he developed stem cell and gene therapy products for neurodegenerative and neurometabolic diseases. From there he moved on to the University of Pennsylvania where he received a master's of science degree for his work on the structure and folding of proteins involved with Alzheimer's and Parkinson's diseases. 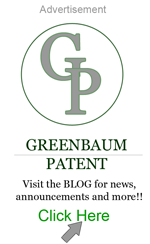 After receiving a law degree from St. John's University in New York, Mr. Greenbaum founded Greenbaum PC to provide Intellectual Property and Technology law services to companies and individuals from around the world. Eric Greenbaum is licensed to practice law in the state of New York and before the United States Patent and Trademark Office. The E46K mutation in alpha-synuclein increases amyloid fibril formation. J Biol Chem. 2005 Mar 4;280(9):7800-7. Structure and properties of alpha-synuclein and other amyloids determined at the amino acid level. Proc Natl Acad Sci U S A. 2005 Oct 25;102(43):15477-82. BACE overexpression alters the subcellular processing of APP and inhibits Abeta deposition in vivo. J Cell Biol. 2005 Jan 17;168(2):291-302.